MESSAGE FROM THE PRESIDENT - rcsi-star's JimdoPage! I am very pleased that RCSI, in conjunction with surgical Royal Colleges in Edinburgh, England and Glasgow is today announcing the launch of an international Fellowship examination. 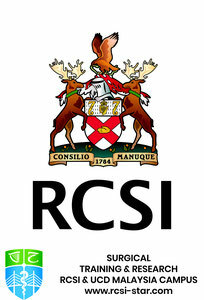 RCSI has collaborated with sister Royal Colleges to offer the Joint Surgical Colleges’ Fellowship Examination (JSCFE) in response to the growing need for an international examination that marks an endpoint of surgical training for doctors and certifies their capacity to act as independent practitioners. For your information, I attach a press release about the JSCFE. More comprehensive information on this initiative will be available shortly and a dedicated website will be established. I will correspond with you again soon in that regard. I am delighted also to inform you that RCSI’s ‘2013 Calendar for Professional Examinations’ has just been published. Please see attached that document, which contains information on dates and domestic/overseas venues for those exams. I would be most grateful if you disseminate the above information and appraise colleagues who may be interested in such opportunities to affiliate with RCSI.